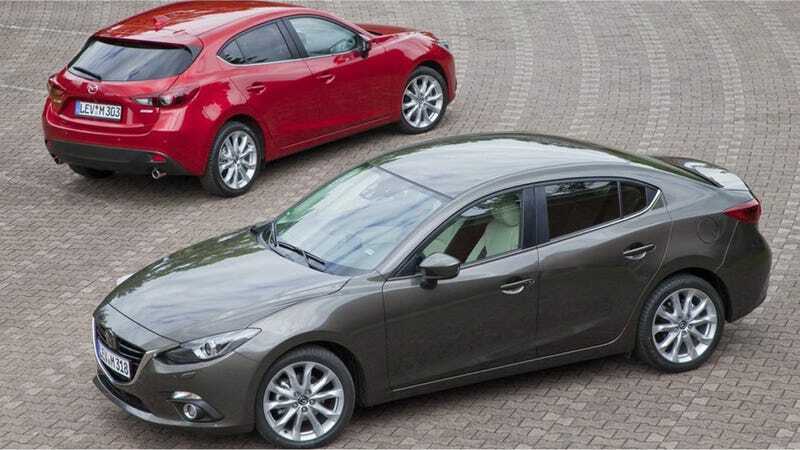 It's number time for the 2014 Mazda3! What is arguably the most exciting car in this segment can be yours starting at just $16,945, and it will get 30 mpg in the city and 41 mpg on the highway. Why buy a hybrid over this? Autoblog reports that that price is for the base i SV sedan model with a six-speed manual transmission and the SKYACTIV 2.0-liter, 155 horsepower four-cylinder engine. Moving up to the i Sport sedan and hatchback will put you out $18,445 and $18,945, respectively. Prices go all the way up to the 2.5-liter, 184-horsepower Gran Touring hatchback, which starts at $26,495. While I personally have not driven the newest Mazda3 yet, Travis has, and he walked away convinced of its excellence. I'm a big fan of its predecessor, and when I had the new Mazda6 with the 2.5-liter engine, I was truly impressed with its fuel economy, and I hardly drove it like some doddering hypermiler. Right now, you can only get a 2.5-liter Mazda3 with the six-speed autobox, but Mazda says they'll be adding the manual later on. Regardless of engine and transmission choice, all of them hit near or more than 40 mpg on the highway, which is awesome. Full details on the various models and their fuel economy over at Autoblog. Not bad, Mazda. Not bad at all.